This recipe for kale juice contains Vitamin A, K and C galore. In the summer when it's hot outside, it provides great hydration. If you are like me, meaning you don't drink your eight glasses of water every day, you will find great comfort in the research I read recently. It proves that freshly squeezed vegetable and fruit juices hydrate better than water as they contain Potassium and Magnesium, naturally present in your cells. It gets absorbed very fast and brings nutrients straight to the destination. It improves your eyesight. Add ground flaxseed or drink it with some oily meal for better absorption. Finally, it improves quality of your nails and bones. Five weeks course of daily cup of kale juice can strengthen your nails and stop breakage. Where to buy kale juice? People ask this question a lot, and the answer is, I don't know. I have never seen kale juice sold in health stores, unlike wheat grass juice that is expensive, but at least available. Making kale juice at home is very easy though, and if you grow a lot of kale, this could be your best choice. You will take advantage of 100% nutrients preserved because your kale gets straight from your vegetable garden into your juicer. 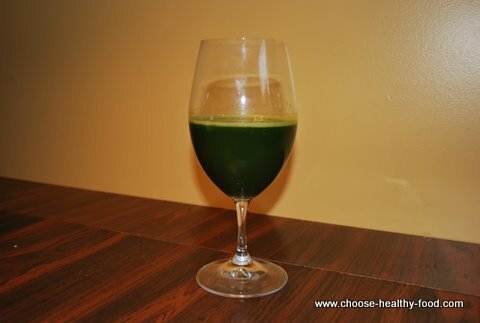 What's in this kale juice recipe? This recipe produces 5 cups of kale juice. Each cup contains your two days' required amount of Vitamin C, and five days amount of Vitamins A and K, 20% of your daily Calcium, Magnesium and Potassium. 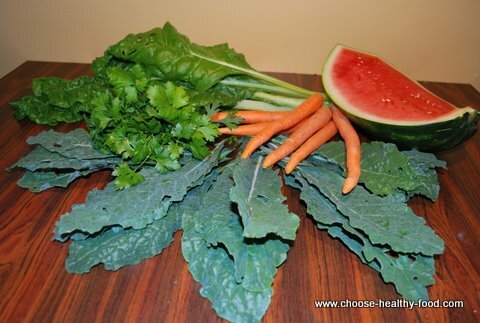 To make this juice, I used parsley, kale, swiss chard, carrots, and watermelon. Look at this picture and tell me honestly, can you really eat this much greens just because they are good for you? Wash and peel carrots. Wash apples and parsley. Cut the watermelon out of its skin into long slim pieces or cubes. Cut carrots lengthwise to fit into your juicer . If your juicer can process kale without mixing it with carrots, do it to get carrot pulp separated from the greens. Otherwise, alternate pieces of kale, apple, and carrot. This amount produces five portions. You can store kale juice in tightly closed jar for one day.